Private sector insurance player Future Generali India Life Insurance Company on Monday announced that it has received prestigious ISO 9001:2008 certiifcation for its Investment Processes. 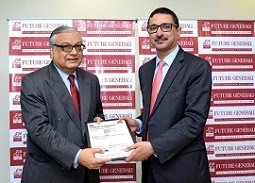 Future Generali India Life Insurance Company Limited is a joint venture between Mr. Kishore Biyani's the Future Group, which runs chains of large discount department stores and warehouse stores, and Italy-based global insurance giant the Generali Group. ISO 9001:2008 is the internationally recognised standard for Quality Management Systems (QMS). To qualify for the certification the insurer had to meet rigorous standards in its investment practices, investment documentation review, pre-audit, initial assessment and clearance of all non-conformities. The process which went on for about 3 months culminated in a comprehensive certification audit by BSI (British Standards Institution). It certification approves Future Generali's compliance with internationally established standards for Quality Management Systems in its investment department. “This is a proud moment for us and we will continue to focus on quality management systems in the company. We are a customer centric organisation and are committed to continuously improve ourselves to adapt global standards and in providing best in class services to our customers. The Investment Department in an insurance company is of vital importance, this accreditation validates our respect for the trust and confidence our customers have instilled in us", said Mr. Munish Sharda, Managing Director & CEO (Officiating) of Future Generali India Life.